Welcome to the Student Membership Page! Members-Only teleconferences, allowing you to listen in meetings held in other cities by Constituent Societies - free for student members with a code provided by the NFMA. Student Members also receive discounted registration to NFMA meetings - perfect for enhanced professional training as well as networking with municipal industry professionals. Consider joining the NFMA today. Dues are complimentary for qualified students (until graduation) and their professors. 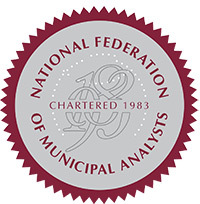 Fugiel Scholarship: Students are encouraged to apply for the Fugiel Scholarship, which will provide tuition, and approved travel expenses to the NFMA's Introduction to Municipal Bond Credit Analysis held each fall. Interested students should contact the NFMA for more information.